Launching a new business is no small task, especially if you are starting up from scratch with limited amount of resources on hand. Besides the passion and drive that’s needed to keep one going, there’s a host of essential start-up tasks to be carried out in order get up and running in a short time. Customer acquisition is one such task that’s high on the agenda of any new business owner. After all, no Customers means no business, right! So, if you are one of those budding entrepreneurs who is looking for Leads and prospects, let me share with you these effective and proven means to find customers and grow your business. TV/Newspaper Ads, Outdoor Display Ads, Flyers and so on, there’s a plethora of options available to spread the word around about your new business and attract customers. But not everyone has the luxury of a big marketing budget at their disposal for an all-out promotion and blitz. While Sales is one of the key focus when starting up, you probably need to allocate money for admin, accounting, staff and office space related expenses too. Then, how does one ensure that a limited marketing budget is put to good use and delivers its expected ROI? A marketing strategy that can deliver immediate results plus help in the long term development and brand visibility for the company economically, is what’s needed. With the reach and ubiquity of the internet, Online Marketing is one avenue that can be leveraged to achieve these objectives. These days having a Company Website is a must. Just as you’d print business cards to hand out, it is imperative to have a web presence that you can mention about to your associates & prospects. Most entrepreneurs do realize this and invest in standing up a Business Website, however your website should be more than just an “online business card”. Your Website should employ quality content, optimization best practices, good UX features and an ongoing update strategy. And, its best to have these considerations included during the design & development phase of your website. A well optimized, content rich website can deliver a tremendous marketing mileage for your business in the long term. We all know the ineffectiveness and wastage of traditional marketing methods – handing out flyers (which end up in trash cans), cold calling (refused with annoyance) or Print/TV Ads (mostly ignored). However, if marketing is targeted, contextual and relevant then it is better received, effective and economical. 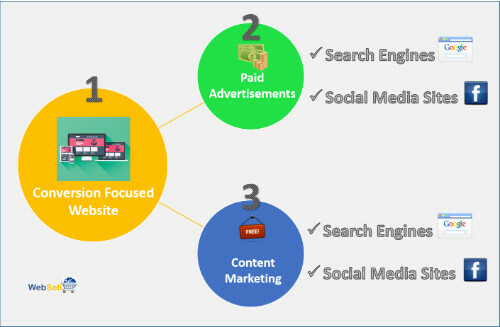 Paid Ads on Search Engines which are displayed relevantly to the search query which the user performs are highly effective. Moreover, Pay-Per-Click marketing programs like Google Adwords offer tremendous amount of flexibility in terms of the budget you wish to spend, location where you want to target and the time during which you wish to advertise. This allows your business to stand before a wanting audience at a budget and duration that you are comfortable with. Social Media Paid Advertising offers precision advertising to a highly targeted audience based on demographics, location, interests, etc. In short, Search & Social Media Paid Ads can offer a decent bang for your buck if you are seeking leads quickly within a small budget. Today’s discerning shopper makes his or her buying decision well in advance, even before talking to a sales rep. The buying decision is shaped largely by online research, word of mouth and mention from friends. If your business is not visible online during that phase you are at risk to lose out, agree? So, invest in Content based marketing. Useful, informative, educational content that is socialised on the internet brings a lot of visibility to your brand. Search Engines reward websites that have quality content, which is optimized and is linked to, with higher rankings. And higher ranking mean more clicks and more traffic to your website. In the same vein, a social media presence with engaging content that attracts fans and influencers brings recognition and prominence. The key thing here is that this Visibility is awarded FREE, and gives long term benefits. But has to be earned over a period time. To summarize, with the right mix of paid, owned and earned media online, your business can have a consistent flow of leads and customers. The options discussed here can certainly deliver ROI whether you are looking for something short term or intend to invest for the long run.